Neptune recently passed behind the Sun at solar conjunction. From Fairfield, it is not observable – it will reach its highest point in the sky during daytime and is no higher than 2° above the horizon at dawn. Neptune is the outermost known planet in the Solar System, orbiting the Sun at a distance of 30.1 AU once every 164.8 years. It is a giant planet, composed primarily of gaseous hydrogen and helium, with a trace of hydrocarbons such as methane, the latter giving it a characteristic blue color. Its mass is 17.1 times that of the Earth, and its radius is 3.8 times that of the Earth. It rotates on its axis once every 16.1 hours. In the night sky, Neptune is a faint object. At magnitude 7.7, it is well beyond the reach of the naked eye, but given good seeing conditions it is fairly easy to distinguish through any telescope as a small extended disk measuring 2.5" across. Neptune was the second planet to be discovered in the telescopic age, in 1846. The first was Uranus, discovered telescopically by William Herschel in 1781, meanwhile all of the planets out to Saturn had been known since prehistory. The discovery of Neptune was made by Johann Gottfried Galle of the Berlin Observatory, who noted its extended disk and movement across the sky from one night to the next. Galle was not, however, the first astronomer to have seen Neptune. Several earlier observations have been identified where observers seem to have seen Neptune but recorded it as a star. For example, John Herschel may well have seen it in 1830, and Galileo may even have seen it over two centuries earlier, in 1613. The discovery of Neptune is often seen as the greatest achievement in the history of celestial mechanics, because the planet's presence was predicted before it was seen. A year before its discovery, two mathematicians, Urbain Le Verrier and John Couch Adams, had studied the orbit of Uranus and observed that it showed significant deviations from the elliptical path which Newton's laws dictated it ought to follow. One way to explain these was the presence of another massive planet nearby, exerting a gravitational distortion its orbit. So good were the predictions made by Le Verrier and Couch Adams, that when Galle found Neptune, it lay a mere one degree from the position predicted, though this was largely due to good luck: there were in fact substantial inaccuracies in Le Verrier's workings. At around the same time, Le Verrier's also noted that Mercury's orbit showed similar anomalies, and he used the same logic once again, proposing another hypothetical planet, dubbed Vulcan, which orbited even closer to the Sun than Mercury. This time Le Verrier was to be disappointed, and Vulcan was never found. The puzzling anomalies in Mercury's orbit remained unexplained until Albert Einstein showed that Mercury's orbit lies sufficiently close to the Sun for relativistic effects to become apparent. Neptune has only ever been visited once by one spacecraft: the Voyager 2 probe flew past it in August 1989. Neptune comes to opposition once every 370 days – its synodic period – almost exactly once a year. The date when it comes to opposition moves 4–5 days later each year. Where it lies in the sky affects how easily it can be observed from the northern or southern hemispheres, and because, by definition, it lies almost directly opposite the Sun at opposition, there is a close relationship between the time of year when Neptune comes to opposition, and how well placed it is for observation. When Neptune comes to opposition in the northern summer months, the Sun is high in the northern sky, which places the opposite side of the eclipic plane in the southern sky. This means that Neptune is poorly placed for observation from the northern hemisphere when at opposition in the summer. Conversely, if Neptune is at opposition in December, it is sure to be high in the northern sky. Because Neptune comes to opposition at almost the same time of year in successive years, this means that it remains in the northern or southern sky for decades at a time. 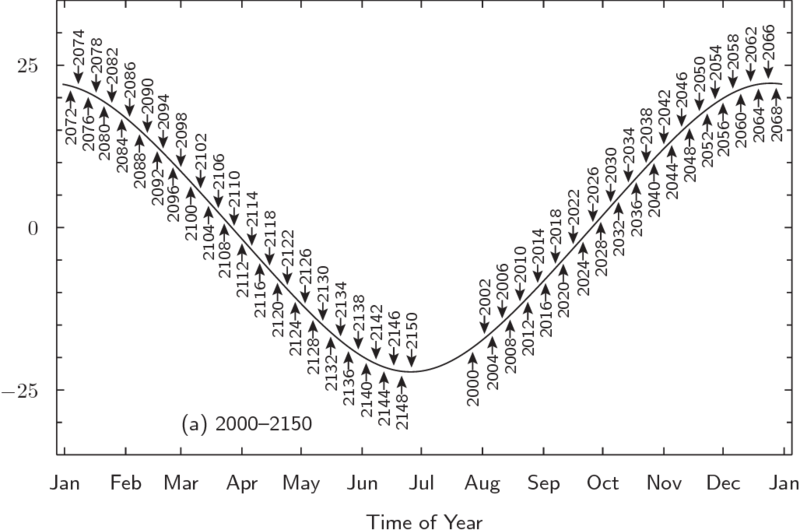 The chart below shows the time of year of all of Neptune's oppositions between the years 2000 and 2150, together with the declination that Neptune will have at the time, measured on the vertical axis. A chart of the time of day when Neptune rises and sets on any given day of the year can be found here. A chart of Neptune's path relative to the background stars can be found here.